This week I talked about “An Edible History of Humanity” on The Forum, an excellent BBC World Service show which puts together three guests from entirely different fields to see what happens: in this case an Australian expert on fire, a Romanian Dadaist poet, and me. (You can hear the show here.) One of the guests is also invited to present a slightly silly “60 second idea” to improve the world, so I proposed making everyone over the age of 40 play video games. (You can hear that bit here.) After the show had been recorded, but before it aired, Charlie Brooker in The Guardian published a very good list of games that everyone should try, which is very much in the same vein; his choices were bang on. Anyway, back to the food. I recently contributed to the Spiked debate on the future of food and did a Q&A on the book for Mother Nature Network. I’m also taking part in an event in New York in January linked to the Silk Road exhibition at the American Museum of Natural History. I’ll be talking about the connections between food, trade and cultural exchange, along with a history professor and a chef. I’m the glue, I guess. I love the AMNH because of the planetarium, the whale, the dinosaur exhibits laid out in evolutionary order (take that, creationists), and because it does amazing things like this. It’s been a bit quiet around here lately, in part because I’ve been in rural Uganda researching mobile phones. It was also a good opportunity to see subsistence farming close up, and find out what farmers in the developing world are doing on the ground. Anyway, in the past month the Los Angeles Times has run a Q&A with me in which I am described, strangely, as “the ultimate foodie”. Time Out picked “Edible History” as one of its “best new food books”. The Guardian ran a favourable review. The Daily Telegraph picked up the “farming was a big mistake” discussion. The Financial Times included the book in its “hottest holiday reading” selection. I also wrote an Op-Ed for the Los Angeles Times, drawing parallels between 18th-century concerns about the potato and modern worries about genetically modified crops. Yup, historical analogy again. There was one point I didn’t have room for, which is worth mentioning. I am in favour of GM in theory although, as I note in the piece, so far the technology has not really delivered the goods in practice. That said, I think one of the risks of an over-reliance on GM is that monocultures are vulnerable to the appearance of an unexpected disease or predator. The Irish Potato Famine is, of course, the single best example of the danger of monocultures in food history. So that’s another lesson from the history of the potato. How can we learn from it? What we need is lots of different GM crops to provide variety, rather than dominance of a few strains from a couple of big companies. And there’s no reason, as I point out, why future GM crops might not come from government research labs, which could do a lot to neutralise anti-capitalist opposition to GM. If the government of Mexico or India, say, produces a GM wheat that is drought-tolerant and requires very little fertiliser or pesticide, gives away the seeds to farmers and allows them to reuse seeds from one year to the next, wouldn’t that be a good thing? 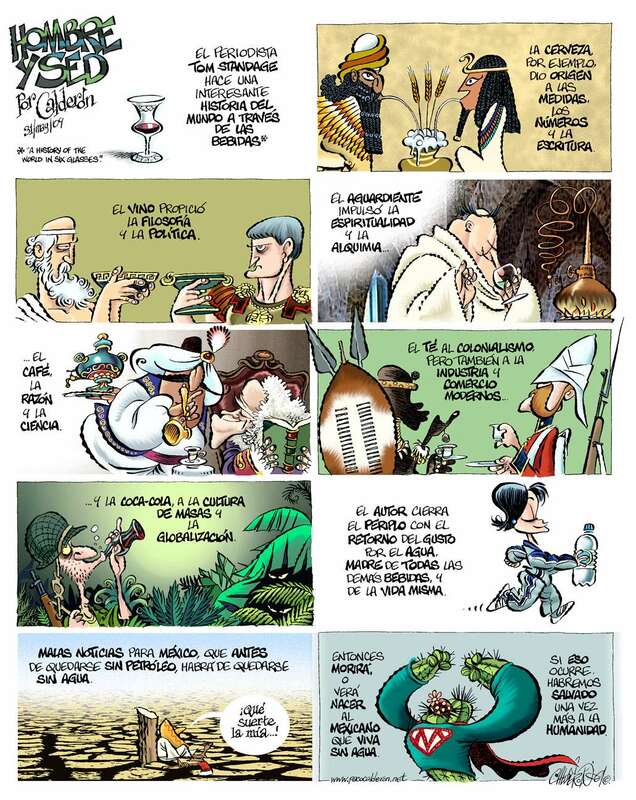 This has got to be the most unusual book review I’ve ever had: Paco Calderón, a Mexican cartoonist, has reviewed “A History of the World in 6 Glasses” in the form of a cartoon (left). As an occasional cartoonist myself, I think this is an excellent use of the art form. Meanwhile, I am still on the road promoting “An Edible History of Humanity” with various personal appearances and radio interviews. This week I was on NPR’s Talk of the Nation, and I was also interviewed by NPR affiliate KUOW in Seattle, in a wide-ranging conversation that also covered some of my other books. While on tour I have been doing a fair amount of culinary tourism. In San Francisco I visited TCHO to pick up some chocolate (I wrote a story about the company last year), and went to Ritual Coffee Roasters to try coffee made with a Clover machine. I had a cup of Fazenda Kaquend, the winner of the Brazil Cup of Excellence competition. Normally I put sugar in my coffee to take the edge off it, but there was not a hint of bitterness. In Berkeley I had ice cream at Ici, which was also excellent. But I have to admit that my favourite discovery was that Anchor Liberty Ale was available on tap at SFO. It is my favourite beer. I am now in Iowa. Time for some corn. UPDATE June 6th: After an on-stage conversation about my book at the Printers Row Literary Festival in Chicago with Mike Gebert of food blog Sky Full of Bacon, I asked Mike for a lunch suggestion, and we ended up going to Frontera Grill. Chef Rick Bayless is the dean of “white table-cloth Mexican food”, apparently. We had ceviche and tostaditas, after which I had poached eggs with masa boats, black beans and crumbled chorizo. With some Goose Island “Summertime” beer. A delicious and suitably American end to my tour. Thanks, Mike! 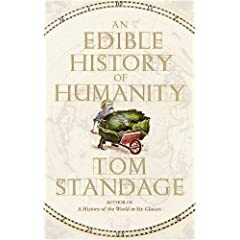 There have been more reviews of “An Edible History of Humanity” in the Financial Times, Scotland on Sunday, the Toronto Star and the National. As a result I was asked to go on the BBC Radio 4 “Today” programme. This pushed the book to #68 on Amazon.co.uk — not that I am checking obsessively, you understand. It also prompted a rather odd editorial from the Guardian, which seems to think that I am opposed to agriculture in all its forms (when I am, in fact, merely interested in why anybody originally adopted it, given the relative drawbacks of farming compared with hunting and gathering). Jared Diamond, among others, has argued that the adoption of agriculture was the worst mistake in the history of the human race. It’s a convincing argument, when you compare the lifestyles of hunter-gatherers with those of early farmers. But agriculture is, of course, the basis of civilization as we know it. So we can hardly object — particularly those of us who live in industrialised societies, the very definition of which is that most people are no longer farmers. Living in the rich world, as I do, I can safely say that agriculture is a good thing. People trapped in a life of subsistence agriculture in the developing world may well feel otherwise, however, and might well agree with Diamond. My new book, “An Edible History of Humanity”, was published on May 12th in Britain and America. It has already been reviewed in New Scientist and the Sunday Times. And there’s an interview with me about the book over at gourmet.com, accompanied by a rather terrifying picture of me eating a scone at Fortnum & Mason. Not a pretty sight. Click at your peril. The first reviews of “An Edible History of Humanity” have appeared in Kirkus Reviews and the Library Journal. There have also been some early reader reviews from Amazon and BookBrowse. The book is out on May 12th in Britain and America. Kirkus Reviews: Society is what it eats. That’s the contention of Economist business editor Standage (A History of the World in Six Glasses, 2005, etc.). Writers have given close scrutiny to the histories of individual foods, cuisines and traditions, he notes, but have rarely looked at the history of food on a global scale. That’s why he decided to write this meaty little volume, which “concentrates specifically on the intersections between food history and world history.” Tapping into fields as diverse as economics, anthropology, archaeology and genetics, the author asks a simple question: Which foods have had the most influence on shaping the world we live in today? Surprisingly, the list is short; corn, wheat, rice and the potato have been predominant in agriculture and commerce. But history isn’t Standage’s only concern. He takes the long view to illuminate and contextualize such contemporary issues as genetically modified foods, the complex relationship between food and poverty, the local food movement, the politicization of food and the environmental outcomes of modern methods of agriculture. It’s a tall order, impressively filled. Food was pivotal in the creation of social hierarchies in prehistoric cultures. It was central to the spread of European colonial powers. The Industrial Revolution sprang from concerns over food. The Soviet Union collapsed because food was running out. Advancements in biotechnology have proved a double-edged sword—a boon to the hungry and a bane to the environment. Written in the lucid, plain and rather stiff prose familiar to readers of the Economist, the book, like the magazine, is cogent, informative and insightful. An intense briefing on the making of our world from the vantage point of food history. Library Journal: Standage’s previous book, A History of the World in 6 Glasses , theorized that the titular six drinks were reflections of the eras in which they were created. In this new work, he instead shows how one of humanity’s most vital needs (hunger) didn’t simply reflect but served as the driving force behind transformative and key events in history. 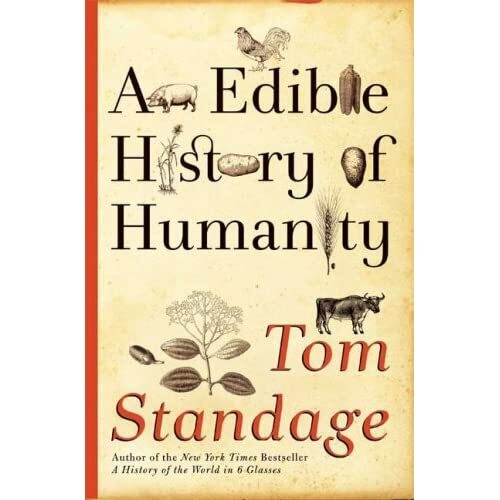 Dividing the vast subject into six general sections (such as food’s role in the development of societies and social hierarchies, its impact on population and industrialization, and its uses as a weapon both on the battlefield and off), Standage illustrates each section with historical examples and observations. Some topics, like the spice trade’s encouragement of exploration, are fairly obvious choices, but the concise style and inclusion of little-known details keep the material both entertaining and enlightening. Perhaps the most interesting section is the final one, which looks at the ways in which modern agricultural needs have acted as a spur for technological advancement, with Standage providing a summary of the challenges still faced by the green revolution. Recommended for both public and academic libraries.